Selecting the best emergency eyewash equipment can be a complicated endeavor. And the lack of an emergency eyewash station is one of the most frequent OSHA Citations. It is crucial from a compliance and work-safety perspective to equip your organization with a quality unit. The ANSI/ISEA Z358.1 provides the foundational guidelines for selecting, and storing, operating as well as maintaining emergency equipment. 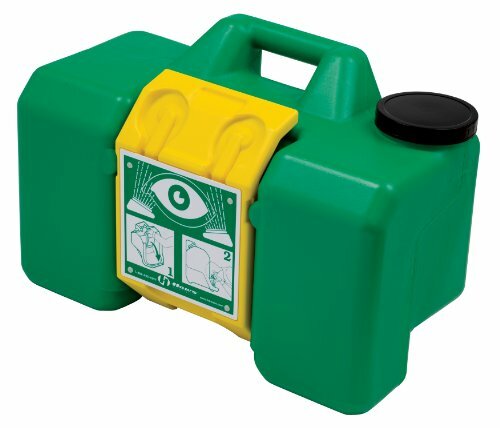 Portable eye wash station﻿s fill a niche in the emergency eye safety market. They are ideal for remote areas or workspaces without convenient access to plumbing. The eye safety solutions do need to be replaced upon expiration, but the best units, including the Guardian AquaGuard below, make this a simple task. 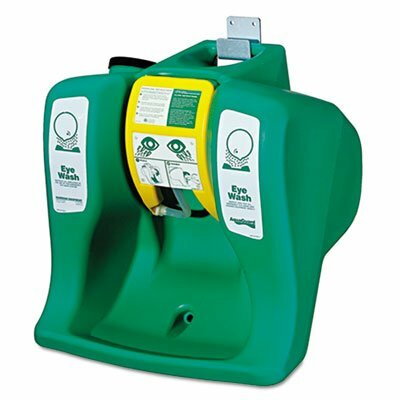 Let's take a look at some of the best selling portable eyewash stations on the market now. You can hang it or put it on a rolling cart. It ships with a hose but you'll need to use a container for it to drain into. (2) Pre-installed 16oz. bottles with unique "Eye-Opener" and mirror with space for (10) optional 1/2oz. single use eyewash vials. With dimensions of 22 (W) by 22 (D) by 22 (H) inches, this eye wash station has a capacity of 16 gallons. 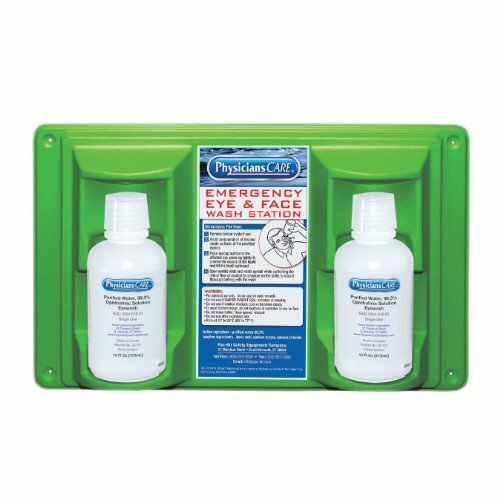 This eye-wash kit contains a no-leak polyethylene tank, 3-inch long drain hose and a steel mounting bracket. No plumbing is required to install it. To activate, you simply have to pull down the yellow eyewash tray. It could continually flow for up to 15 minutes unless you swing the tray up to stop it. While it is a good buy, some users don’t like that it’s a little bulky when installed on the wall. 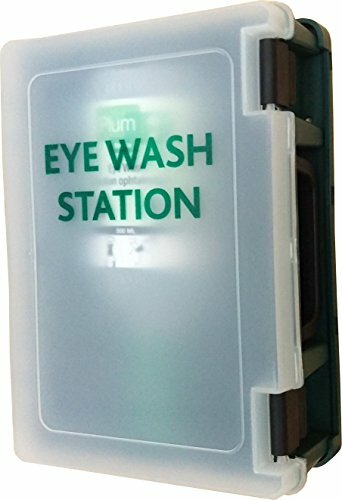 This skin flush station is another solid, portable eye wash unit that has received solid acclaim from the buyers we surveyed. It includes a sterile isotonic buffered solution that can be used for washing, flushing and irrigating the eyes and skin in case of an emergency. It is effective for removing dust, chemicals and pollen that are aggravating the eyes, as well as relieving itching and burning skin. With its plastic squeeze bottle and nozzle, you can easily direct the solution into the affected areas without wasting any of the solution. The eye and skin flush kit ships with 2 single-use bottles of 16 ounce solution and a wall-mountable station that measures 17.5” L x 3.75″ W x 10.75″ H. It can be installed without plumbing. Although some buyers we surveyed said that it is a bit pricey compared to other similar products, it does have some added advantages. The station ships with two 16-oz bottles of buffered isotonic solution, a service tag, a full-color decal and safety poster. The station can be either portable or mounted on the wall without plumbing. This item complies to the standard as recommended by OSHA requirements. 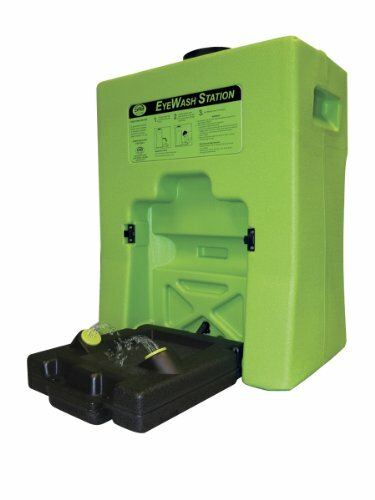 This eye wash station features an FDA-approved high-density polyethylene tank with a 9-gallon capacity and 0.4-gpm flow rate in over 15 minutes. The tank can be easily activated by simply pulling the yellow activation arm down to make an opening. With its wide opening and threaded cap, it allows for easy inspection, filling and cleaning. Moreover, it comes with a stainless steel bracket for mounting on the wall, ideally in remote and low-traffic areas. 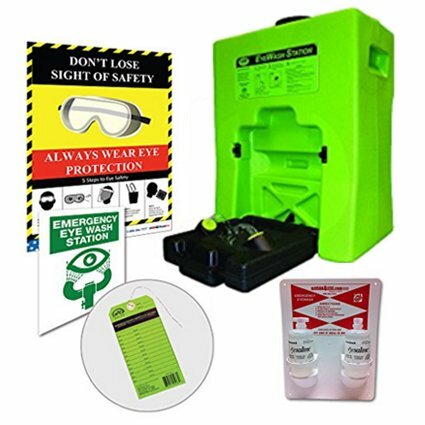 This product is certified by the CSA (Compliance, Safety, Accountability) to meet the standard for emergency eyewash equipment. It’s important to note that the sterilize additive is not included. This eye wash station has received only mediocre feedback from the buyers we surveyed. However, it shouldn’t be written off completely- it has other features that may suit your needs. 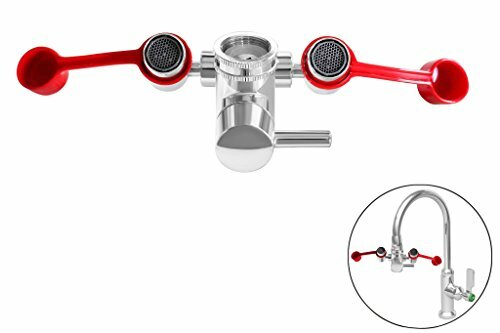 First, it has a huge capacity of 16 gallons and it also meets the ANSI Z358.1-2004 standards for emergency eyewash equipment. It can be easily operated with one hand and it is gravity-fed with 0.4 GPM in 15 minutes. It is portable and can also be mounted on the wall with no plumbing needed. The formulation of this eyewash already includes fungicide, bactericide, and algaecide additive. However, it should be noted that it has received some complaints concerning leaking units. 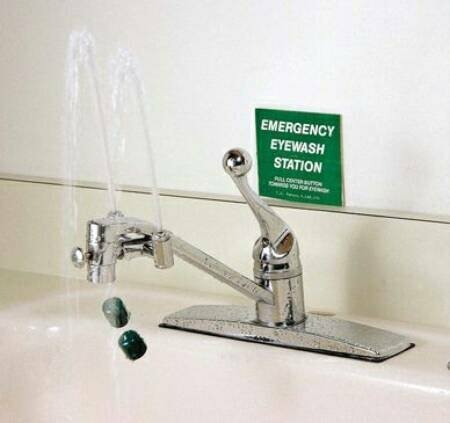 Eye wash stations are an excellent way to prevent and treat eye injuries. 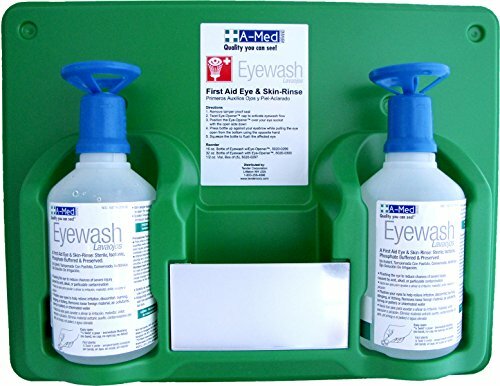 Whether you are purchasing a eyewash station for a large organization, or you are a solo practitioner who just needs a convenient and lightweight emergency eye care kit for their office, the portable safety units we described above can sell either requirement. If you have access to plumbing, and the dedicated resources to install one, an eye wash with a drench hose, a diverter, deck flange, or a faucet mount- these are more advanced safety options that you can explore installing. A portable eyecare station is a great way to maintain OSHA compliance while increasing the scope of your emergency safety coverage should you need to provide it to remote areas that lack plumbing infrastructure. When a worker is exposed to a contaminant in there eye from a dangerous or harmful chemical or material, time is of the essence. Having workers trained to understand how to access an emergency eyewash station, and having it conveniently located, can be the difference between a positive outcome and negative one. Ideally, an eyewash station should be situated in any area where employees can be potentially exposed to hazardous materials. Hazardous materials could include things like caustics or other types of substances and compounds that have the potential to adversely affect the safety and health of the individual. OSHA's policies regarding eyewash stations can be complex, so it's better to be safe than sorry- that is why having several of these portable units accessible inside the work area is a great way to ensure ongoing compliance. (Credit to Select Safety) The first important element is that you should be aware of where the eyewash emergency station is located. Additionally, you should have some prior knowledge of how to work it. Generally, the portable units that we have discussed above function by pulling the lever. To turn them off, you will simply need to reverse what you did to turn it on. It's important to flush the eye for at least 15 minutes. 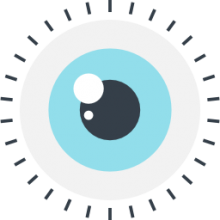 During that time, you should be keeping your eyes as open as possible, rotating your eyeballs in every direction so that all of the contamination is effectively flushed out. Then, you should visit a physician or a hospital to ensure that there is no long-term damage. In terms of ongoing safety, you need to make sure that the stations eye solutions haven't expired. A good way to keep track of this if you don't have a Safety Coordinator at your organization, is to set up Google calendar reminders, or use Amazon or to purchase an ongoing and scheduled supply of what you need. It is also crucial to keep the area surrounding this emergency station free and clear- that way in the event of an emergency, when somebody is experiencing vision obstruction they will be able to access the eyewash without tripping over impediments. Electrical equipment should also be kept far away from the station. If you are looking to purchase one of these eye care and safety devices, make sure that the unit is compliant and that it is the best fit for your needs. Review OSHA documentation and even contact the eye safety companies themselves if you have any questions regarding operation, maintenance or compliance-related issues.